In 2008, Los Angeles County voters approved the Measure R sales tax increase — and, along with it, a long list of transit and road projects to be funded by the half-penny sales tax hike. One of those projects: improving traffic in the area of the 4.5-mile gap in the 710 freeway between Alhambra and Pasadena. On Feb. 15, a series of 18 public meetings will begin and continue through the end of March. 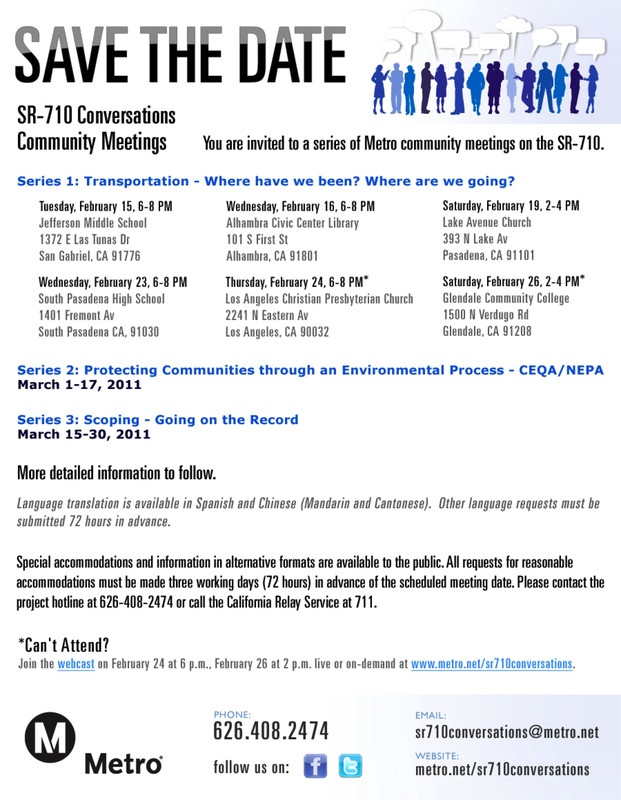 Metro is billing the meetings as a chance to have a “conversation” with the public about the 710 gap, its history and possible solutions. The meetings, too, are the start of a new process to study what project — if any — might help traffic. Some quick background: The 710 freeway opened between Long Beach and Valley Boulevard on the Alhambra/Los Angeles border in 1965. The goal, at the time, was to complete the freeway to Pasadena but controversy and lawsuits stopped it from happening, leaving a 4.5-mile gap between the 710 and a planned junction with the 210 and 134 freeways in Pasadena. Not surprisingly, traffic has diverted to other roads, including surface streets in Alhambra, Los Angeles, South Pasadena and Pasadena. As with any issue carrying the weight of decades of history and controversy, the 710 gap can be an emotional topic. It is important to note that Measure R allows Metro — the lead agency on any project that may follow — to have a fresh opportunity to engage the public on finding solutions to this issue. The flyer below has a list of the meeting dates, locations and times. The first meeting at each location will focus on “transportation: where have we been and where we are going” and will look at transportation systems in the region. The second meeting will provide an overview of the state and federal environmental study process intended to project communities from project impacts. The third meeting will then review the “scoping” process that leads to a list of project ideas, as well as the issues involving the 710 gap that need to be studied. Scoping is the beginning of the environmental review process that could lead to a proposed project. Here’s the website with more details on the meetings. The 710 conversation can also be followed on Twitter and on Facebook. A subway would be just the thing. I know many want the 710 freeway connected to the 210 and many are wildly opposed. Perhaps a study should be done to see where the commuters who would want to drive on the freeway that may never be built go. A subway would get people off of the road. That would be better than building yet another freeway. It’s important to note that this connection is most important for truck traffic, not commuters. Therefore we have to look for solutions that move freight rather than passengers. A freight rail tunnel would have higher capacity and be cheaper to build per unit length and less polluting. I know various such plans have been floating around, some more grandiose than others. The city of Alhambra should charge $100 tolls to residents of South Pasadena until they allow for 710 completion. Ironic how South Pasadenan’s have ZERO problem driving through much more historic neighborhoods on the the 110 but somehow think their generic bungalows are extra special. Traffic isn’t a fixed quantity that exists regardless of the infrastructure that is there to funnel it around. Freeways make it easier to drive and by doing so accommodate existing traffic AND CREATE NEW TRAFFIC. As I understand it, this freeway expansion (let’s be real, that’s been the idea from the start) has been bitterly opposed by the people who live in its path (can’t say I blame ’em). It’s also opposed by people who think about things like all of the improved transit service that could be bought with the $3.7 billion (with a “b”) a 710 tunnel is projected to cost according to the Measure R expenditure plan. I guess that’s in there because of the delicate political compromise that is Measure R. But you never know, people might come around to spending the money differently, especially if they hear an argument for it. The completion of the 710 gap would benefit both the movement of consumer goods, daily commuters and residents in the surrounding areas. There is a greater need for the region for the completion of this project than the savings of a few houses in the path of the route. I say, build the missing link ground level at the most direct route to the 710/210/134 interchange. If this gap is to be filled in than it should at least be a transit corridor which could feed into the el monte transitway and metrolink line. Seriously if we are to build anymore freeways, if we really really must (which we really should not be since what we have is beyond well built out), then at least lest do something smart with them by making them multimodal rights of way. LA cannot just keep building car only corridors (freeways) incessantly without having some foresight and flexibility in their use. This is 2011 for heavens sake and we are still building freeways the way they were in the 1950s!! Its an outdated way of thinking which no longer can address the future needs of large metro areas efficiently.